I can safely tell you nothing will make you tingle quite so much today as Cardi B stroking a shag rug while whispering about how it’s ‘very soft, very warm and fuzzy, fuzzy, fuzzy’. Indeed, your insides will begin to feel just a tad bit like the aforementioned rug as Cardi’s rubs the material softly against the mic; all the while whispering in a way which will bristle even the finest of your neck hairs. 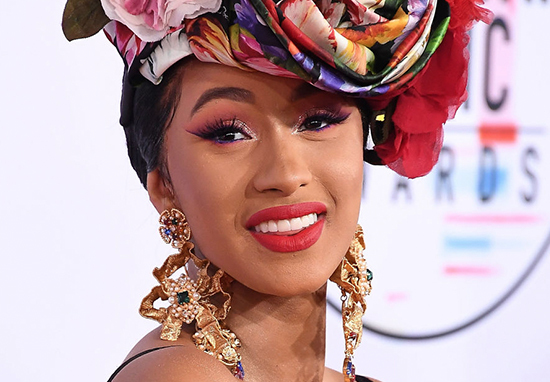 Cardi already has a distinctive speaking voice. But in this ASMR video, where she emphasises and repeats certain words (‘lovely, lovely, lovely’), her soothing vocal qualities are revealed. The 26-year-old rapper has a particularly comforting presence in the video; all warm shades of gold and pale pink. This is particularly true when she wafts the rug at the camera invitingly, asking, ‘do you feel it? It’s in your face. I want you to lay right next to it’. The ASMR video was filmed for an interview with W Magazine, and begins with Cardi discussing her own love for ASMR; confessing her husband finds it weird how she has to watch ASMR videos every night before bed. However, this absolute pro has clearly been studying well! My favourite thing about being a mother is that, um, I have somebody to look forward to looking at every single day and night. I get very anxious to see my baby 24/7 and I love my baby’s face. And I love her breath. And I love her smile. And I love how she looks at me. She looks at me like she needs me. More than anything, anything, anything, anything, anything. Shortly after this she reveals a wooden children’s toy and begins to slowly slide the colourful beads this way and that, making a satisfying clunking noise. At one point, she stroked and tapped her long, painted nails against the base of the toy, letting the mic amplify the everyday sound into something else entirely while she moved the toy around. Have you ever seen anything this intensely relaxing, yet utterly bizarre?